For the third straight year, the Haunted House Indy team traveled up north to Niles, Michigan to check out the one and only Niles Haunted House Scream Park! The three-hour drive is always worth it. And I must say, for only being the second weekend, they were PACKED. First up, the main house at Niles. This year's theme was Cinema, with a lot of classic movie monsters coming to life. The cinematic theming is second to none and was awesome to see and experience. It's very hard to ignore the amount of time and effort that has clearly gone into this house. A must-see for sure. The Krampus attraction was so cool. If you're familiar with the legend, then you'll get a huge kick out of this one. The details are extraordinary and the scares are genuine. A+, for sure. And as for Cabin 13, this takes the cake for me. The theming and setup are absolutely incredible. Granted, I'm a sucker for anything woodsy or campy, so yeah, we loved Cabin 13. The field is always one of my favorite parts of Niles, and 2016 was no different. It just keeps getting better and better, The mazes are classic. And the bayou setup is utterly fantastic. The field is sort of hard to describe, it's definitely something you have to experience. Ah, the hayride. I'm extremely happy to announce that I absolutely loved the hayride this year. You can tell it's something that they try to improve on year after year -- and it is definitely showing. I'll go as far as to say this is, hands down, the best year for the hayride yet. Loved it. We all did. Wow, he gave 5 Skulls to every attraction. And you know what? They deserved it. Niles Haunted House Scream Park continues to be a leader in the haunt field -- not just locally, but nationally. Way to go, guys! For the second year in a row, we made the almost-three-hour trek up north to Niles, Michigan to the Niles Haunted House Scream Park -- and again, we were NOT disappointed. Niles was pretty impressive last year in 2014, but how exactly did it fair in 2015? Each year, the main house at Niles gets a redesign. This year, their theme is Kingdoms End, a haunt based almost entirely on the works on Stephen King. And you know what? It's awesome! Every minute of it. Awesome. Almost all of King's more famous works are represented here. Whether you want to see Carrie get crowned at the prom or pass by a Pet Sematary or even walk through a dark hedge maze, it's all here! Kingdoms End is packed full of scares and surprises and is definitely an attraction you don't want to miss when visiting Niles Scream Park. It's that time of the year again -- haunted house season is officially here! 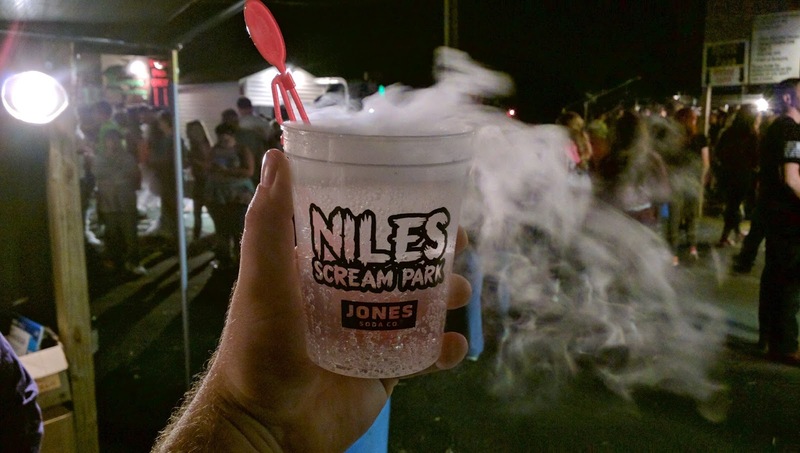 And for the fourth consecutive year, we wandered up North to Niles, Michigan for the one and only Niles Scream Park! Like last year, the main house kept the cinema theme. But this year, they changed up the movies and the decorations. The house is notorious for having numerous ways to get through, and unfortunately for us, we only went through the house once so we didn't get to see and experience every route. But that's okay because what we did see was an easy A+. This is one of Niles' new haunts this year -- and if you haven't guessed, it's got a demonic possession/Exorcist theme. And it works. The set decoration and mood and atmosphere are great. The only thing I feel this haunt needs is a little more action. Otherwise, it's a great haunt. We finally made our way back to Nightmare on Edgewood, our visit since 2014. Edgewood has always been one of the better haunts on Indy's southside, so let's see if it holds up in 2017! First off, this haunt has one of, if not, the best facades I have ever seen: a full-scale old-school entrance! I was completely blown away by it and the awesomeness didn't stop there. Once, inside, the haunt is a straight-up movie theater, complete with entrances to other theaters, full of surprises. Once you're actually "in" the haunt, we found it very reminiscent of their attraction from 2014, Old School Fright (which I loved). But instead of regurgitating their older designs, it appeared to be completely re-worked. Doesn't hurt that all the actors brought their A-games also. We are NOT a haunted house. We are merely a haunt review organization.